Northbrook, IL, May 10, 2016 – Digital Check’s popular Teller Transaction Printer (TTP) is now available for the company’s newest teller-window check scanner, the TellerScan TS500. Like previous versions of the device, the new TS500 TTP model is designed to fit underneath the base of the scanner, saving counter space. 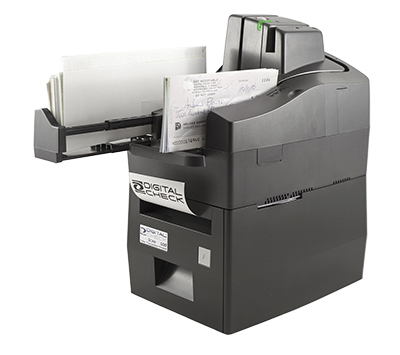 Additionally, the new version was designed to share the same power and data cables used by the scanner providing for better cable management and eliminating the need for extra power plugs or USB ports.The TS500 TTP makes use of updated thermal printing technology, providing rapid, quiet printing at the teller window with no ink ribbons or cartridges. Improvements to speed and power consumption mean the new printer can generate nearly all bank receipts in less than a second while drawing fewer than 50 watts. Like earlier models, the TS500 TTP supports the widely used OPOS interface for retail receipt printers. As with earlier versions, the TS500 TTP can be programmed to print images, designs, logos and marketing messages with the included ReceiptWareTM software. Because the TTP doesn’t use expensive to replace inkjet cartridges, receipts can be customized in virtually any way at no additional cost. The TS500 TTP is available to Digital Check customers as of May 1. For more information, visit www.digitalcheck.com. Digital Check provides superior check scanners and document capture products for teller capture, branch automation, remote deposit capture, and remote lockbox applications. Digital Check’s award-winning TellerScan®, CheXpress®, BranchXpress®, and SB electronic scanners are among the most cost-effective and reliable in the industry, and provide high-quality images with precise MICR accuracy.